Council Directive 92/46/EEC of 16 June 1992 laying down the health rules for the production and placing on the market of raw milk, heat-treated milk and milk-based products ( 6 ) provided for a list to be drawn up of third countries or parts thereof from which Member States were to authorise the introduction of milk or milk-based products and for such commodities to be accompanied by a health certificate and comply with certain requirements, including heat treatment requirements, and guarantees. Accordingly, Commission Decision 2004/438/EC of 29 April 2004 laying down animal and public health and veterinary certifications conditions for introduction in the Community of heat-treated milk, milk-based products and raw milk intended for human consumption ( 7 ) was adopted. Since the date of adoption of that Decision, a number of new animal health and public health requirements have been laid down, constituting a new regulatory framework in this area, which should be taken into account in this Regulation. In addition, Directive 92/46/EEC was repealed by Directive 2004/41/EC of the European Parliament and of the Council of 21 April 2004 repealing certain Directive concerning food hygiene and health conditions for the production and placing on the market of certain products of animal origin intended for human consumption ( 8 ). Regulation (EC) No 178/2002 of the European Parliament and of the Council of 28 January 2002 laying down the general principles and requirements of food law, establishing the European Food Safety Authority and laying down procedures in matters of food safety ( 9 ) lays down the general principles governing food and feed in general, and food and feed safety in particular, at European Union and national level. Directive 2002/99/EC lays down rules governing the introduction from third countries of products of animal origin intended for human consumption. It provides that such products are only to be introduced into the European Union if they comply with the requirements applicable to all stages of the production, processing and distribution of those products in the European Union or if they offer equivalent animal health guarantees. Regulation (EC) No 852/2004 lays down the general rules for food business operators on the hygiene of foodstuffs at all stages of the food chain, including at primary production level. Regulation (EC) No 853/2004 lays down specific rules for food business operators on the hygiene of food of animal origin. That Regulation provides that food business operators producing raw milk and dairy products intended for human consumption are to comply with the relevant provisions of Annex III thereto. Regulation (EC) No 854/2004 lays down specific rules for the organisation of official controls on products of animal origin. Commission Regulation (EC) No 2073/2005 of 15 November 2005 on microbiological criteria for foodstuffs ( 10 ) lays down the microbiological criteria for certain micro-organisms and the implementing rules to be complied with by food business operators when implementing the general and specific hygiene measures referred to in Article 4 of Regulation (EC) No 852/2004. Regulation (EC) No 2073/2005 provides that food business operators are to ensure that foodstuffs comply with the relevant microbiological criteria set out in that Regulation. Under the scope of Council Directive 92/46/EEC, raw milk and products thereof could only be obtained from cows, ewes, goats or buffaloes. However, the definitions of raw milk and dairy products set out in Annex I to Regulation (EC) No 853/2004 broadens the scope of milk hygiene rules to all mammalian species and defines raw milk as milk produced by the secretion of the mammary gland of farmed animals that has not been heated to more than 40 °C or undergone any treatment that has an equivalent effect. In addition, it defines dairy products as processed products resulting from the processing of raw milk or from further processing of such processed products. In view of the entry into application of Regulations (EC) Nos 852/2004, 853/2004 and 854/2004 and the acts implementing those Regulations, it is necessary to amend and update European Union public and animal health conditions and certification requirements for the introduction into the European Union of raw milk and dairy products intended for human consumption. In the interests of consistency of Union law, this Regulation should also take into account the rules laid down in Regulation (EC) No 470/2009 of the European Parliament and of the Council of 6 May 2009 laying down Community procedures for the establishment of residue limits of pharmacologically active substances in foodstuffs of animal origin, repealing Council Regulation (EEC) No 2377/90 and amending Directive 2001/82/EC of the European Parliament and of the Council and Regulation (EC) No 726/2004 of the European Parliament and of the Council ( 11 ) and its implementing rules laid down in Commission Regulation (EU) No 37/2010 of 22 December 2009 on pharmacologically active substances and their classification regarding maximum residue limits in foodstuffs of animal origin ( 12 ) and Council Directive 96/23/EC of 29 April 1996 on measures to monitor certain substances and residues thereof in live animals and animal products and repealing Directives 85/358/EEC and 86/469/EEC and Decisions 89/187/EEC and 91/664/EEC ( 13 ). Council Directive 96/93/EC of 17 December 1996 on the certification of animals and animal products ( 14 ) lays down the rules to be observed in issuing certificates required by veterinary legislation to prevent misleading or fraudulent certification. It is appropriate to ensure that certification requirements at least equivalent to those laid down in that Directive are applied by the competent authorities of exporting third countries. 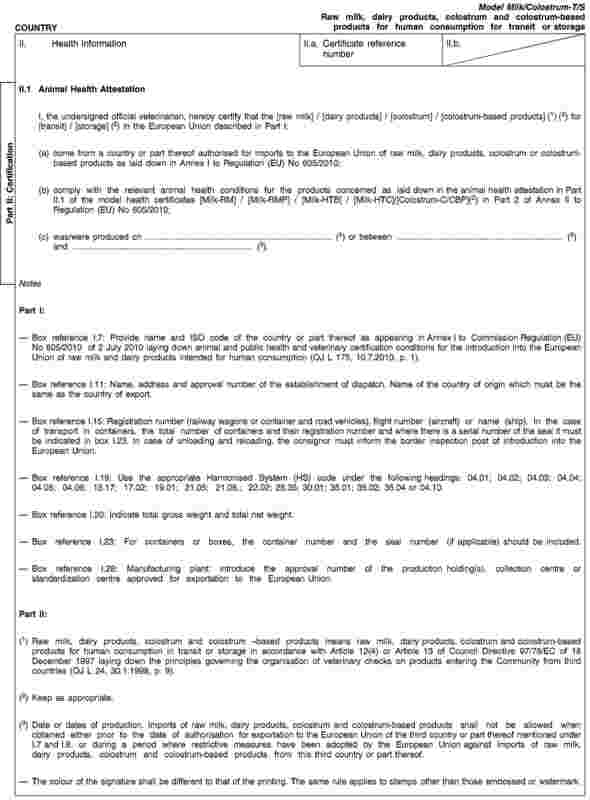 In addition, Council Directive 90/425/EEC of 26 June 1990 concerning veterinary and zootechnical checks applicable in intra-Community trade in certain live animals and products with a view to the completion of the intenal market ( 15 ), provides for a computerized system linking veterinary authorities which has been developed in the Europena Union. The format of all model health certificates need to be amended to take into account their compatibility with possible electronic certification under the Trade Control and Expert System (TRACES) provided for in Directive 90/425/EEC. According, the rules laid down in this Regulation should take account of TRACES. Council Directive 97/78/EC of 18 December 1997 laying down the principles governing the organisation of veterinary checks on products entering the Community from third countries ( 16 ) lays down rules concerning veterinary checks on products of animal origin introduced into the European Union from third countries for their importation or transit, including certain certification requirements. Those rules are applicable to the commodities covered by this Regulation. Specific conditions for transit via the European Union of consignments to and from Russia should be provided for, owing to the geographical situation of Kaliningrad, which only concerns Latvia, Lithuania and Poland. In the interests of clarity of European law, Commission Decision 2004/438/EC should be repealed and replaced by this Regulation. To avoid any disruption in trade, the use of health certificates issued in accordance with Decision 2004/438/EC should be authorised during a transitional period. 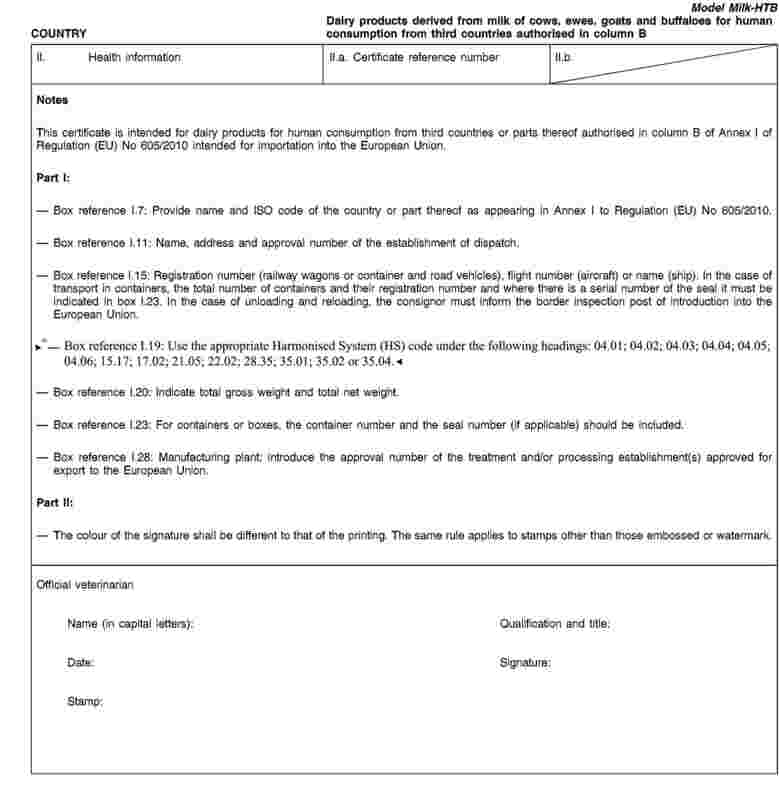 (b) the list of third countries from which the introduction into the European Union of such consignments is authorised. This Regulation shall apply without prejudice to any specific certification requirements laid down in other Union acts or in agreements concluded by the Union with third countries. Member States shall authorise the importation of consignments of raw milk, dairy products, colostrum and colostrum-based products from the third countries or parts thereof listed in column A of Annex I. (b) where applicable, sufficient to ensure a negative reaction to an alkaline phosphatase test applied immediately after the heat treatment. (ii) additional heating equal to or greater than 72 °C, combined with desiccation. (b) an ultra high temperature (UHT) treatment at not less than 135 °C in combination with a suitable holding time. Consignments authorised for importation in accordance with Articles 2, 3 and 4 shall be accompanied by a health certificate drawn up in accordance with the appropriate model set out in Part 2 of Annex II for the commodity concerned and completed in accordance with the explanatory notes set out in Part 1 of that Annex. However, the requirements laid down in this Article shall not preclude the use of electronic certification or of other agreed systems, harmonised at European Union level. (d) they are certified as acceptable for transit, including for storage as appropriate, on the Common Veterinary Entry Document referred to in Article 2(1) of Regulation (EC) No 136/2004, signed by the official veterinarian of the border inspection post of introduction into the Union. 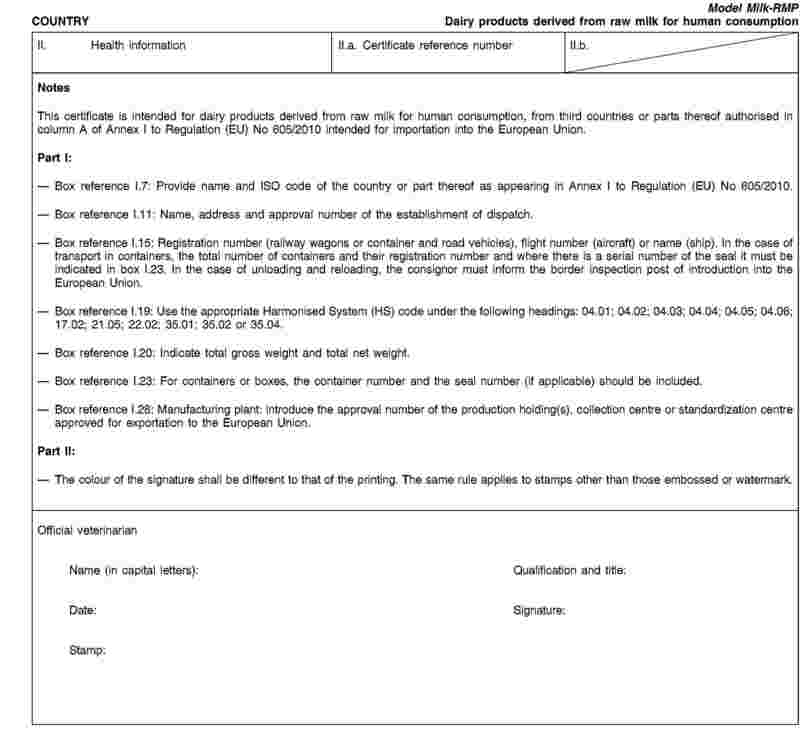 (d) the consignment is certified as acceptable for transit on the common veterinary entry document by the official veterinarian of the border inspection post of introduction into the European Union. 2. Unloading or storage, as defined in Article 12(4) or in Article 13 of Directive 97/78/EC, of such consignments on European Union territory shall not be allowed. 3. Regular audits shall be made by the competent authority to ensure that the number of consignments and the quantities of products leaving the European Union territory matches the number and quantities entering the European Union. (d) the consignment is certified as acceptable for transit on the Common Veterinary Entry Document referred to in Article 2(1) of Regulation (EC) No 136/2004 by the official veterinarian at the border inspection post of entry. 2. Unloading or storage, as defined in Article 12(4) or in Article 13 of Directive 97/78/EC, of such consignments on Union territory shall not be allowed. 3. Regular audits shall be made by the competent authority to ensure that the number of consignments and the quantities of products leaving the Union matches the number and quantities entering the Union. 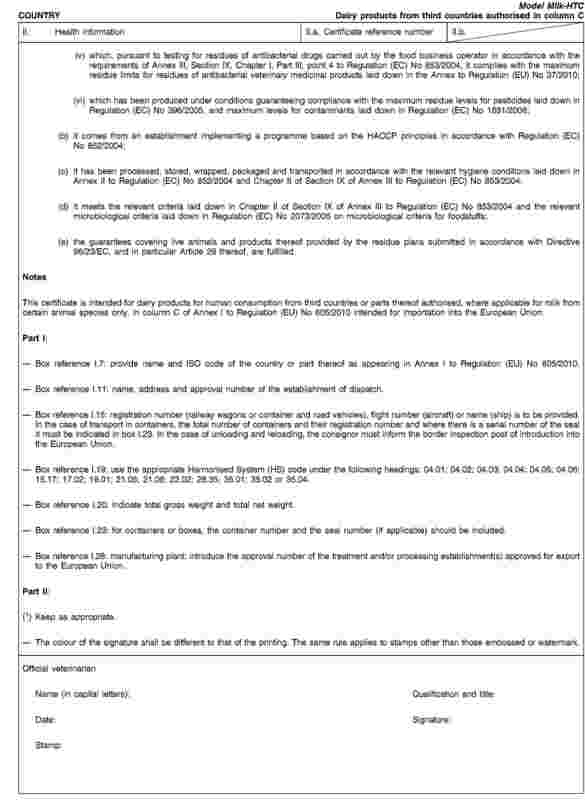 Consignments of dairy products and colostrum-based products authorised for introduction into the European Union in accordance with Articles 2, 3, 4,6 or 7 from third countries or parts thereof where an outbreak of foot-and-mouth disease has occurred within the period of 12 months preceding the date of signature of the health certificate, or which have carried out vaccination against that disease during that period, shall only be authorised for introduction into the European Union if such products have undergone one of the treatments listed in Article 4. 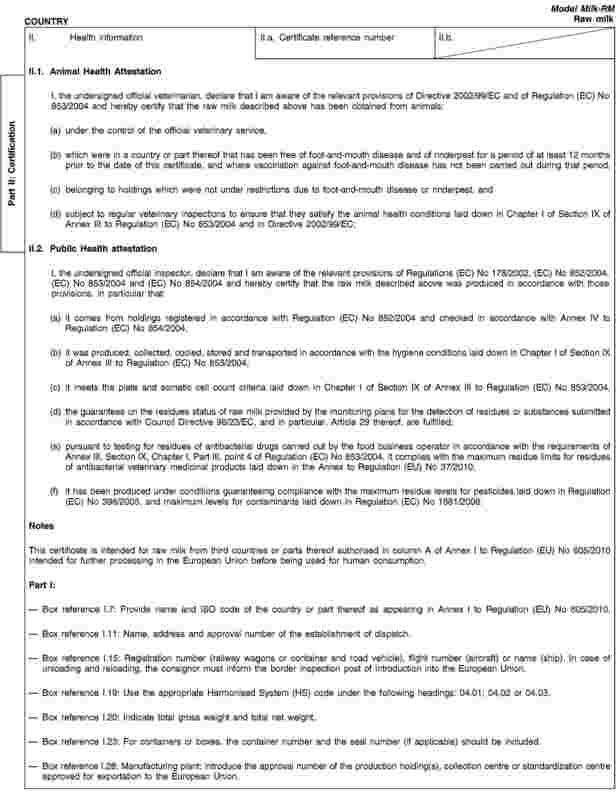 References to Decision 2004/438/EC shall be construed as references to this Regulation. For a transitional period until 30 November 2010, consignments of raw milk and milk-based products as defined in Decision 2004/438/EC in respect of which the relevant health certificates have been issued in accordance Decision 2004/438/EC may continue to be introduced into the European Union. It shall apply from 1 August 2010. (1) The colostrum and colostrum-based products can only be introduced into the European Union from countries authorised in column A. (2) Certificates in accordance with the Agreement between the European Community and the Swiss Confederation on trade in agricultural products (OJ L 114, 30.4.2002, p. 132). (3) The former Yugoslav Republic of Macedonia; the definitive nomenclature for this country will be agreed following the conclusion of the negotiations currently taking place on this subject at UN level. (4) Not including Kosovo which is at present under international administration pursuant to United Nations Security Council Resolution 1244 of 10 June 1999. (5) Only dairy products from camels of the species Camelus dromedarius. (6) Dairy products from camels of the species Camelus dromedarius are authorised. 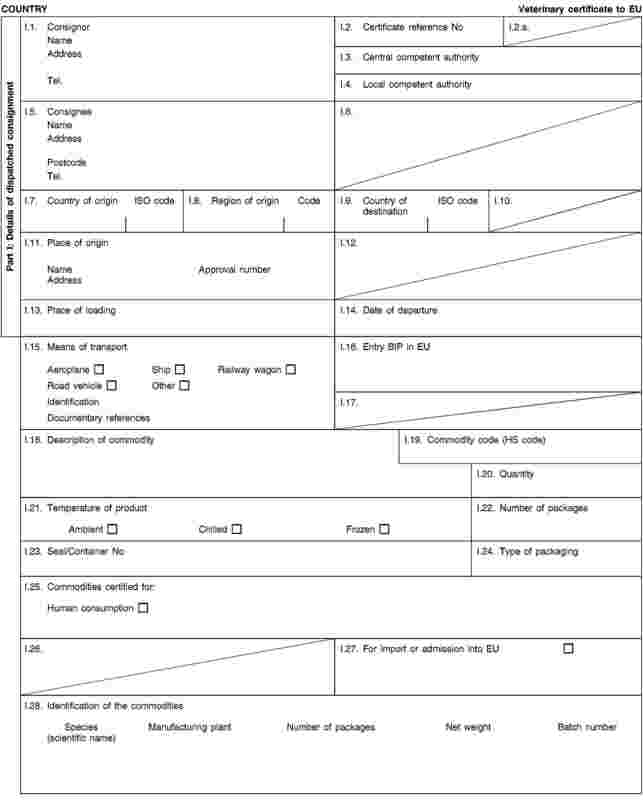 Health certificate for raw milk from third countries or parts thereof authorised in column A of Annex I intended for further processing in the European Union before being used for human consumption. Health certificate for dairy products derived from raw milk for human consumption, from third countries or parts thereof authorised in column A of Annex I intended for importation into the European Union. 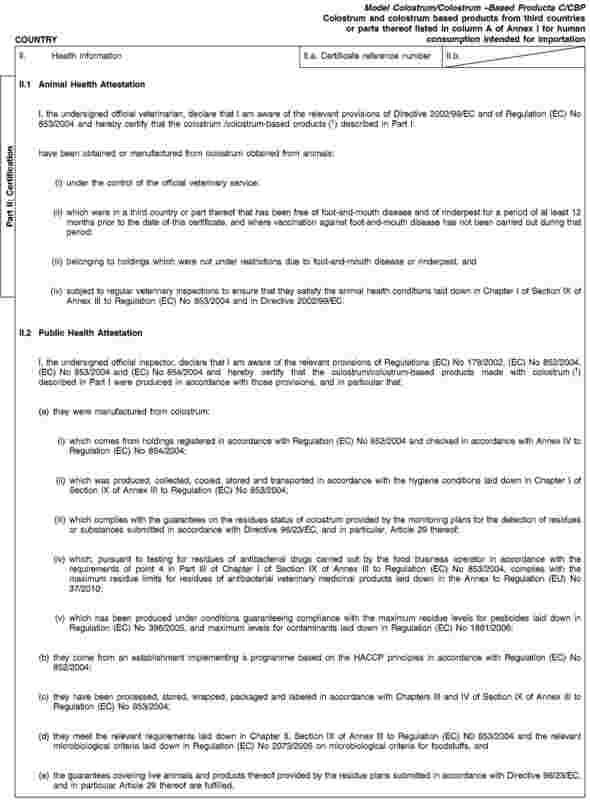 Health certificate for dairy products derived from milk of cows, ewes, goats and buffaloes for human consumption from third countries or parts thereof authorised in column B of Annex I intended for importation into the European Union. 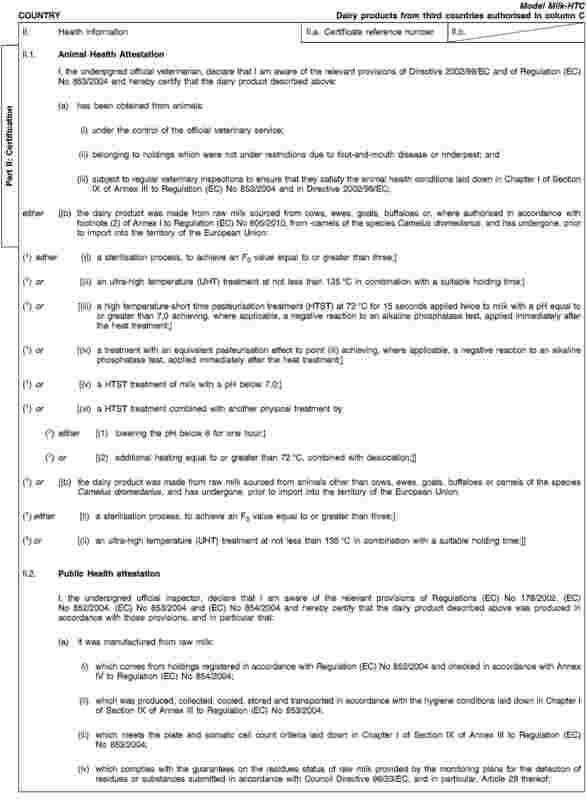 Health certificate for dairy products for human consumption from third countries or parts thereof authorised in column C of Annex I intended for importation into the European Union. Health certificate for colostrum of cows, ewes, goats and buffaloes and colostrum-based products derived from colostrum of the same species from third countries or parts thereof listed in column A of Annex I for human consumption intended for importation into the European Union. Animal health certificate for raw milk, colostrum, dairy products or colostrum-based products for human consumption, intended for transit through or storage in the European Union. (a) The health certificates shall be issued by the competent authorities of the third country of origin, in accordance with the appropriate model set out in Part 2 of this Annex, according to the layout of the model that corresponds to the raw milk, colostrum, dairy products or colostrum-based products concerned. They shall contain, in the numbered order that appears in the model, the attestations that are required for any third country and, as the case may be, those supplementary guarantees that are required for the exporting third country concerned. (b) The original of the health certificate shall consist of a single sheet printed on either pages or, where more text is required, such that all the sheets form a whole and cannot be separated. 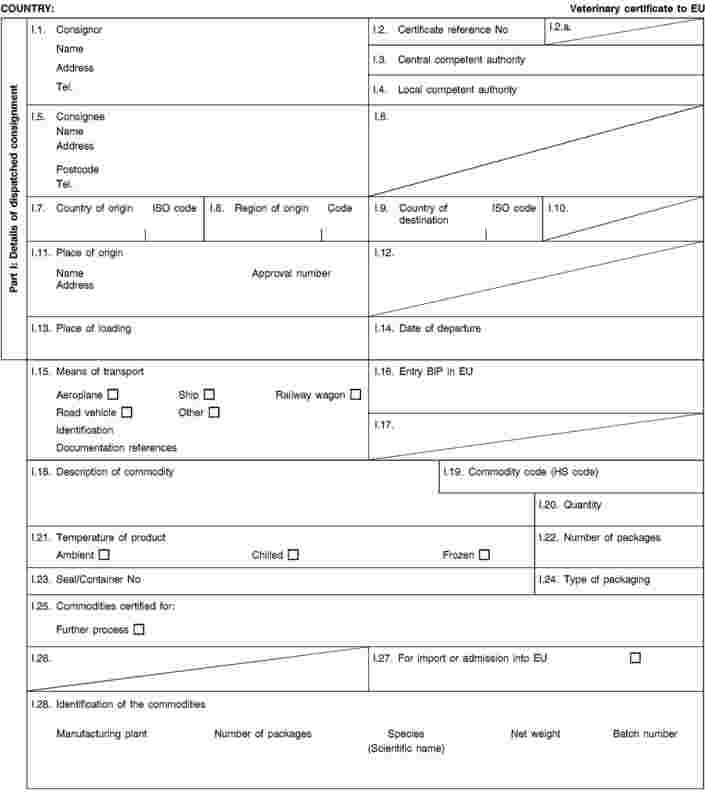 (c) A separate, single health certificate must be presented for each consignment of the commodity concerned, exported to the same destination from a third country listed in the table in Annex I and transported in the same railway wagon, road vehicle, aircraft or ship. 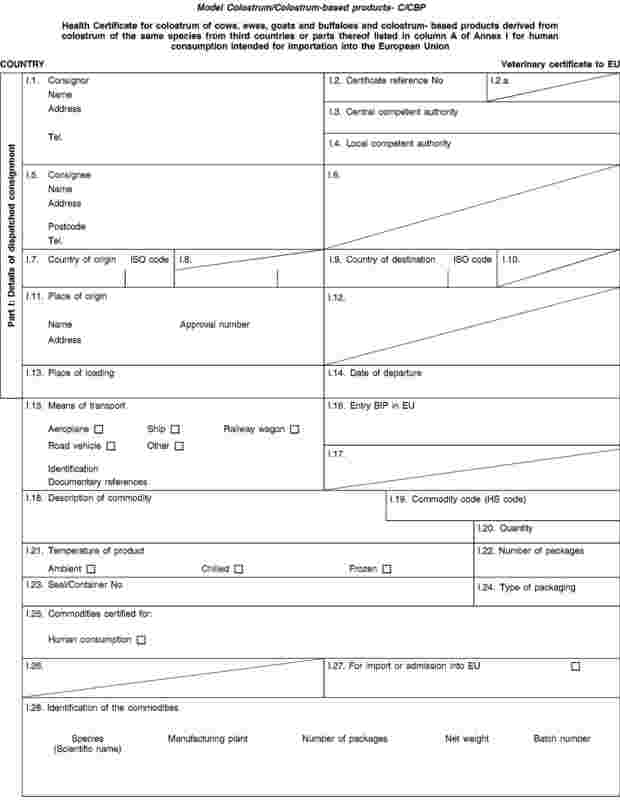 (d) The original of the health certificate and the labels referred to in the model certificate shall be drawn up in at least one official language of the Member State where border inspection takes place and of the Member State of destination. However, those Member States may allow it to be drawn up in another official language of the European Union instead of their own, accompanied, if necessary, by an official translation. 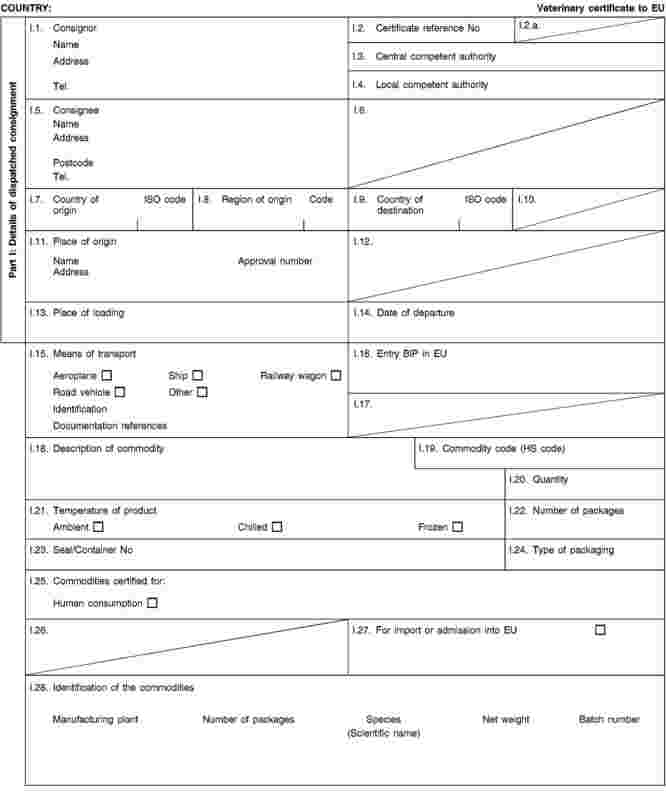 (e) Where additional sheets are attached to the health certificate for the purpose of identifying the commodities making up the consignment, such additional sheets shall also be considered to form part of the original certificate, provided the signature and stamp of the certifying official veterinarian appear on each page. 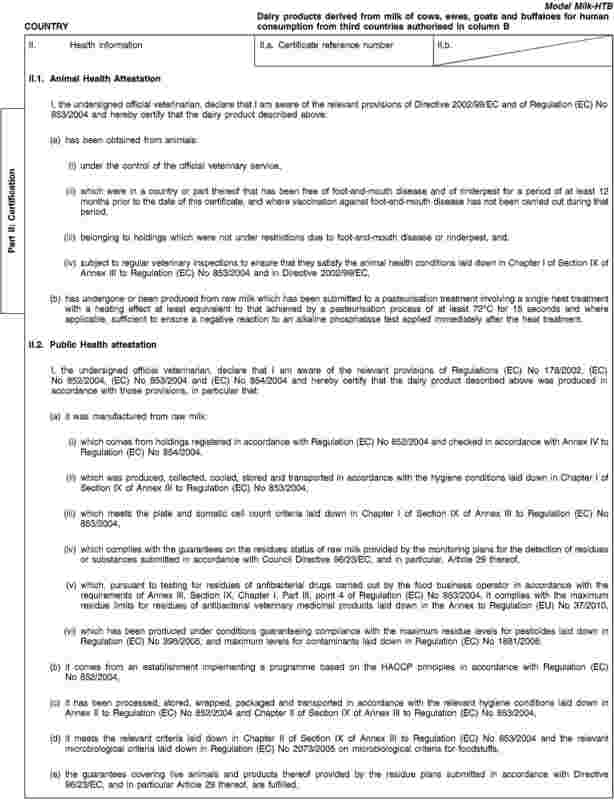 (f) Where the health certificate comprises more than one page, each page shall be numbered ‘–x(page number) of y(total number of pages)–’ on the bottom of the page and shall bear the certificate reference number allocated by the competent authority on the top of the page. 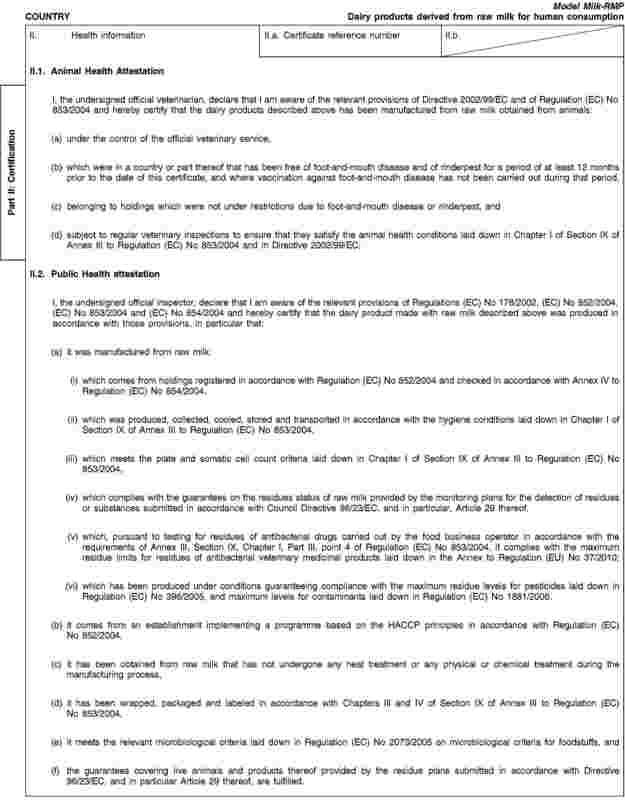 (g) The original of the health certificate must be completed and signed by a representative of the competent authority responsible for verifying and certifying that the raw milk, colostrum, dairy products or colostrum-based products meet the health conditions laid down in Section IX of Chapter I of Annex III to Regulation (EC) No 853/2004 and in Directive 2002/99/EC. (h) The competent authorities of the exporting third country shall ensure that principles of certification equivalent to those laid down in Council Directive 96/93/EC ( 18 ) are complied with. (i) The colour of the signature of the official veterinarian shall be different from that of the printing on the health certificate. That requirement shall also apply to stamps other than embossed stamps or watermarks. 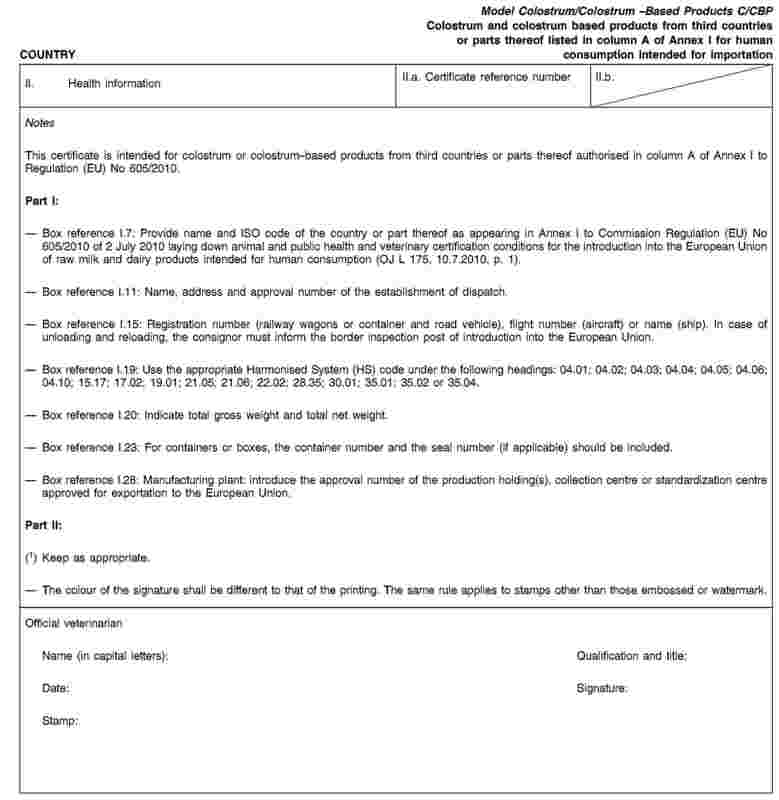 (j) The original of the health certificate must accompany the consignment until it reaches the border inspection post of introduction into the European Union. 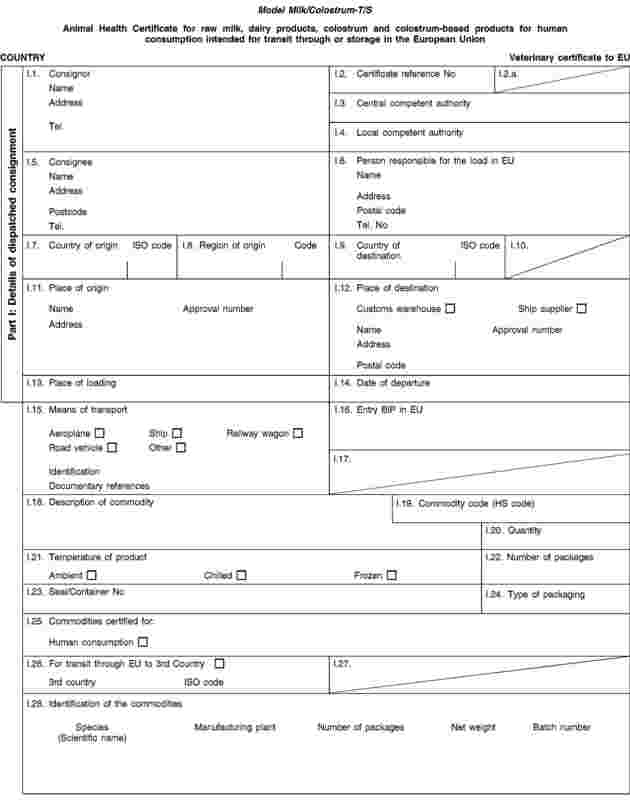 (k) Where the model certificate states that certain statements shall be kept as appropriate, statements which are not relevant, may be crossed out and initialled and stamped by the certifying officer, or completely deleted from the certificate. ( 1 ) OJ L 18, 23.1.2003, p. 11. ( 2 ) OJ L 139, 30.4.2004, p. 1. ( 3 ) OJ L 139, 30.4.2004, p. 55. ( 4 ) OJ L 139, 30.4.2004, p. 206. ( 5 ) OJ L 165, 30.4.2004, p. 206. ( 6 ) OJ L 268, 14.9.1992, p. 1. ( 7 ) OJ L 154, 30.4.2004, p. 72. ( 8 ) OJ L 157, 30.4.2004, p. 33. ( 9 ) OJ L 31, 1.2.2002, p. 1. ( 10 ) OJ L 338, 22.12.2005, p. 1. ( 11 ) OJ L 152, 16.6.2009, p. 11. ( 12 ) OJ L 15, 20.1.2010, p. 1. ( 13 ) OJ L 125, 23.5.1996, p. 10. ( 14 ) OJ L 13, 16.1.1997, p. 28. ( 15 ) OJ L 224, 18.8.1990, p. 29. ( 16 ) OJ L 24, 30.1.1998, p. 9. ( 18 ) OJ L 13, 16.1.1997, p. 28.